✔️ PREPARE FOR YOUR NEXT WATER TOSSING BALL CONTEST IN REAL STYLE, using our unique water balls in bulk pack from 4E's Novelty. These balls are filled with water and are perfect to too around in a swimming pool, a beach party you will have a ball. ✔️ THESE WATER BALLS ARE A CHILD'S DREAM COME THRU. Remember the old times when you had to fill flimsy balloons with water at the sink and cart them in a bowl to the battlefield where half of them tore apart even before a shot was fired. no more suffering this embarrassment. In today's world you toss around this super professional water filled balls which are suited for all water ball play themes, from aggressive winner takes all battle, to a mellow play at the park. ✔️ YOUR CHILDREN WILL JUMP FOR JOY GETTING THEIR HANDS ON THIS PACK OF 24 POOL AND BEACH WATER BALLS. Soak them in water and they get filled with water like a sponge. They can squeeze them or toss them at one another. 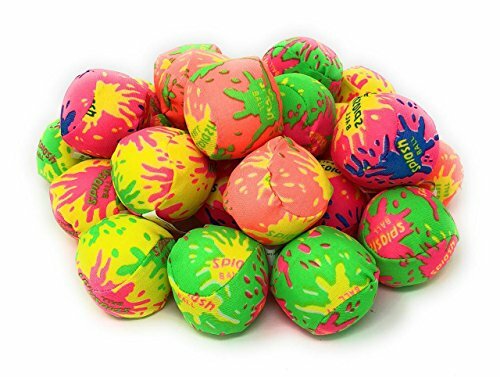 These balls are a very safe and enjoyable way to have a water ball fight. They are soft, and very easy to toss and don't hurt on impact. ✔️ Have an astonishing summer fun day at the park, at the swimming pool or at the beach, enjoy the sunny days WHILE YOUR CHILDREN PLAY GLEEFULLY TOSSING AROUND THESE WATER BALLS. Then can us this for all water play games, like: "strike them all", "first one hit is out", "last one to hit is king", and everything you can imagine. ✔️ THIS BULK PACK OF 24 BEACH WATER BALLS is another top-star fun-play product from the masters at 4E's Novelty. We spare no effort in bringing you the best and brightest fun play toy and party products. We stand 100 percent under our products and if you are not happy you can return any of our products, hassle free, no questions asked. Last, but not least: REMEMBER TO HAVE FUN, LOTS OF IT.